Published in Eclog. Bot. 2: t. 10. 1778. Type: Described from Canada, Labrador. Synonymy. Pedicularis euphrasioides Stephan ex Willd., Sp. Pl. 3: 204. 1800. Vegetative morphology. Plants (8–)9–25 cm high (to 35 cm high on continental North America); biennial herbs; not caespitose. Taproot present. Ground level or underground stems absent. Caudex absent (enlanged biennial taproot present). Aerial stems erect. Aerial stem trichomes present; spreading. Leaves heterophyllous; distributed along the stems (very few basal leaves present in flowering plants); alternate; dying annually and non-persistent. Petioles present (basal leaves), or absent (near the inflorescence); 10–75 mm long; winged (near the blade), or not winged (at the base); glabrous, or hairy, or glabrescent; puberulent (if applicable). Petiole hairs shorter than the diameter of the petiole; spreading; floccose. Leaf blades simple (pinnately divided with (0-)11–32 lanceolate divisions, 1–5 mm long and 1–2.5 mm wide). Leaf blade bases truncate. Blades (15–)20–60 mm long, 6–13 mm wide, spreading, lanceolate, flat, veins pinnate. Blade adaxial surface glabrous. Blade abaxial surface glabrous. Blades cut into linear divisions. Blade margins crenate or dentate, glabrous; apices acuminate, or acute. Reproductive morphology. Flowering stems circular or oval in cross section. Flowering stems with leaves. Flowering stems hairy. Flowering stems puberulent (if applicable). Flowering stem hairs simple; white or translucent; glandular hairs absent. Inflorescences spicate, or racemose; lateral; dense; 2–5 cm long; 25–35 mm wide; not elongating as the fruit matures. Pedicels present, or absent (often inconspicuous; flowers borne in the axils of leaves similar to the basal leaves, but smaller). Flowers bilaterally symmetrical (zygomorphic). Sepals conventional; 5; fused (zygomorphic with teeth about 0.5 mm long on the adaxial surface and partially open on the abaxial surface); 4–7 mm wide; green (sometimes tipped with red). Calyx tubular, or funnel-form; 5-lobed; glabrous. 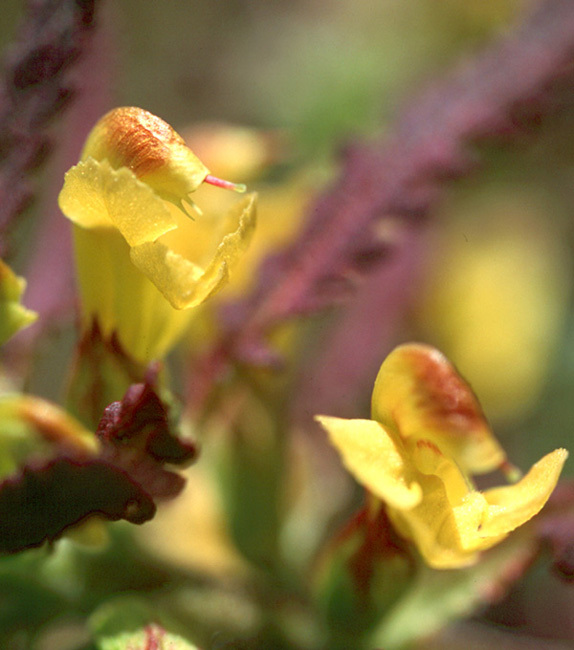 Petals conventional; fused; 5; yellow; with contrasting markings (the helmet petals somewhat red-tinged); 15–18 mm long. Corolla bilabiate; 2-lobed (helmet), or 3-lobed (lip or landing petal); helmet not prolonged into a long beak; helmet with 2 small teeth at the apex (on the lower surface of the corolla). Stamens 4; stamen filaments markedly unequal in length (so that the anthers lie in adjacent pairs); stamen filaments glabrous; free of the corolla. Anthers purple; 2–2.5 mm long. Ovary superior; carpels 2; syncarpous. Ovaries inverse turnip-shaped; glabrous. Styles 1; 14–18 mm long; straight. Stigmas per ovary 1. Placentation axile. Ovules per ovary few. Fruit stalked; with calyx persisting; dry; a capsule; broadly lanceolate; brown to red; 13–16 mm long; glabrous; surface venation reticulate; distinctly flattened; dehiscent; opening at the apex and partially or fully down one side. Seeds brown, or yellowish; surfaces smooth (at 10×), ridged (at 40×). Chromosome information. 2n = 16. (2n) (2x) = 16. Böcher in Löve (1967b, Greenland); Johnson and Packer (1968, northwestern Alaska); Sokolovskaya (1970, northeastern Russia); Krogulevich (1976a, 1978, southern and northern Siberia); Belaeva and Siplivinsky (1975, southern and northern Siberia; 1981, southern and northern Siberia Baikal); Löve and Löve (1982a, Arctic Canada); Dalgaard (1989, western Greenland). Ecology and habitat. Substrates: hummocks, tundra, dry meadows; imperfectly drained moist areas, dry, moderately well-drained areas; moss. Growing in moss with bilberry, CAN 541743; common, especially in low birch and dry heath meadows, CAN 302074. North American distribution. Alaska, Yukon, continental Northwest Territories, Nunavut Islands, continental Nunavut, northern Quebec, Labrador. Arctic islands: Baffin and Banks (New record since Porsild (1957). Considered to be an oligotrophic ericaceous heath specialist by Norwegians. Elven (personal communication, 2005) commented that as this species does not occur in Norway (or Europe) his experience has been based on plants from Greenland, Canada, Alaska, and in 2004, from northeastern Siberia). Northern hemisphere distribution. Circumpolar, or circumboreal (with gaps in northern Europe). KaninPechora, Polar Ural  Novaya Zemlya, YamalGydan, Taimyr  Severnaya Zemlya, Kharaulakh, YanaKolyma, West Chukotka, South Chukotka, East Chukotka, West Alaska, North Alaska  Yukon, Central Canada, Labrador  Hudson Bay, West Greenland. General notes. Polunin (1940) stated that this characteristic species had been collected only three times in the Canadian Arctic Archipelago, one on the "Chidley Peninsula, 60–60.30°N" and twice some miles inland of Lake Harbour. The species is plentiful to the south of the archipelago where it shows a considerable range of variation in such purely vegetative characters as general robustness and the amount of branching. Some specimens growing in boggy situations at Churchill are referable to f. simplex (Hultén) Polunin (Pedicularis euphrasiodes var. simplex Hultén in Kungl. Sv. Vet.-Akad. Handl. Ser. 3, VIII, 2 p. 115. 1930). Flowers without a scent (Porsild 1957). Illustrations. • Habitat. 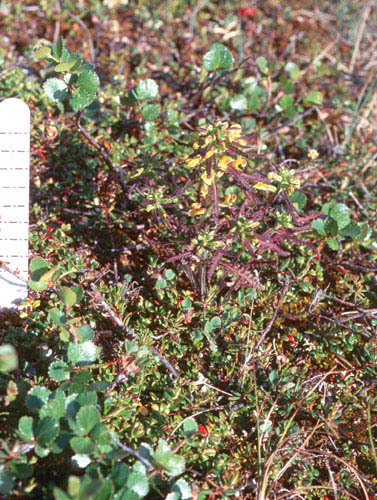 Plant with purplish red leaves and yellow flowers growing in birch heath. Nunavut, Baffin Island, Soper River Valley, Mt. Joy. Aiken and Iles 02–043b. CAN. Scale bar in cm. • Close-up of plant. 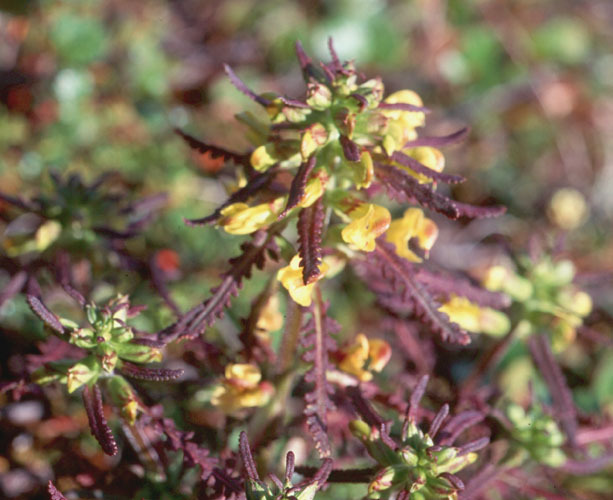 Plant with a branching inflorescence, purplish red leaves, and yellow flowers growing in birch heath. Nunavut, Baffin Island, Soper River Valley, Mt. Joy. Aiken and Iles 02–043b. CAN. 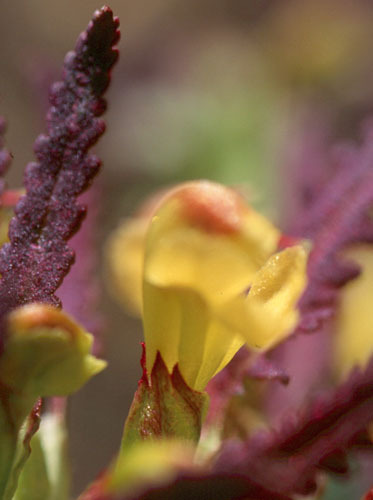 • Close-up of inflorescence. Branching, racemose inflorescence in which flowers on the main stem are opening and those on the branches are in bud. Aiken and Iles 02–043b. CAN. • Surface view of inflorescence in bud. 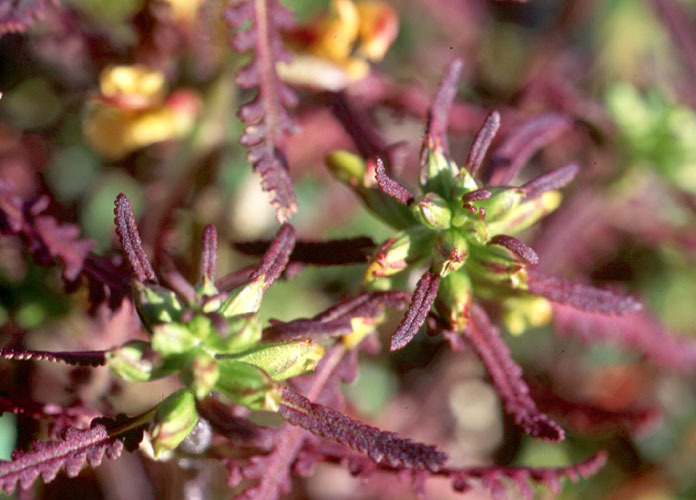 Inflorescence in bud with purplish red leaves and buds with a fused green calyx that has red tips to the sepals. Aiken and Iles 02–043b. CAN. • Side view of flower. Note fused green calyx with red "teeth". Aiken and Iles 02–043b. CAN. • Close-up of flower. Flower with a bi-labiate corolla of three lower petals that are longer than the red-tinged helmet petals. Note the two teeth on the lower surface of the helmet petals. Aiken and Iles 02–043b. CAN. • Side view of receptive flower. 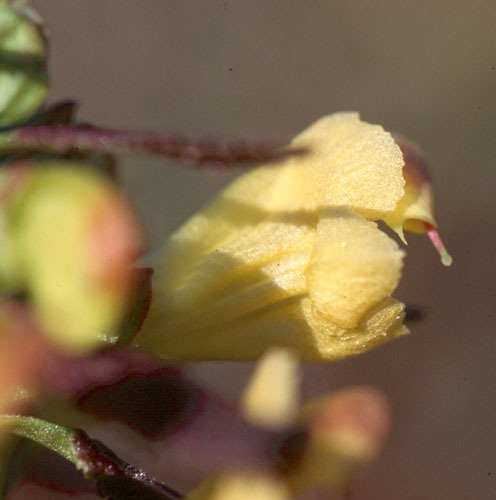 Side view of flower with the lower petals of the bi-labiate corolla around the arching, just visible, helmet petals. Note a tooth on the helmet petals and the exposed, globose stigma. Aiken and Iles 02–043b. CAN. 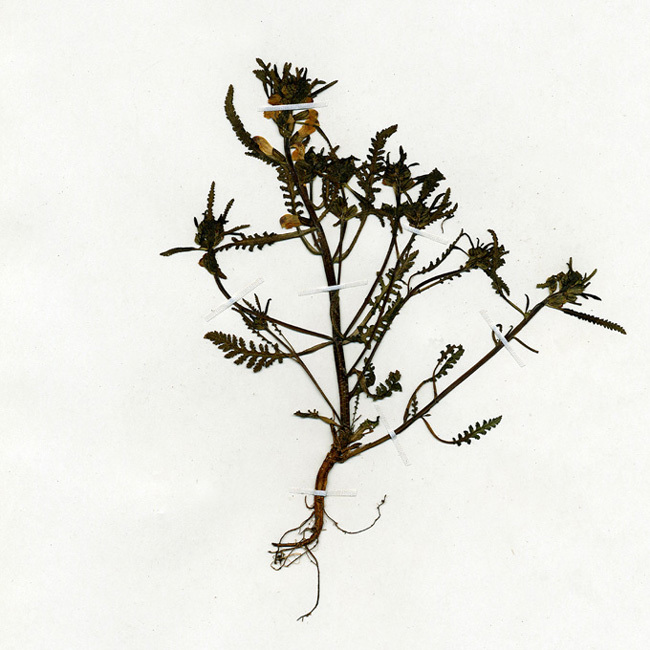 • Herbarium sheet. 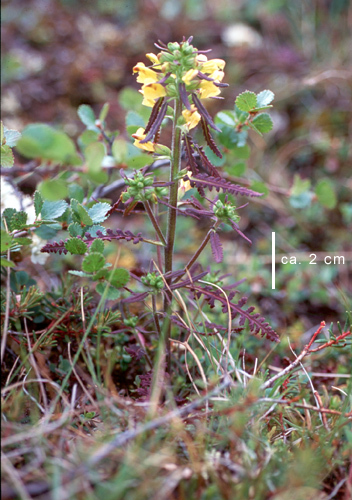 Plant with small caudex tapering to a taproot, and much branched aerial stems, an unusual character in Canadian Arctic members of the genus. • Arctic Island Distribution.